With the help of Analytics—and with just a few easy clicks—you've learned that there are many opportunities in the pipeline that need attention, and you know where they're concentrated. But here's another question you want to answer: Which products are generating the most potential revenue in the pipeline? Looking to your data to answer this question, you'd like to group all pipeline amounts by product. And you'd like to display all that information for all products in a single chart. A pyramid chart can do that by displaying number of product opportunities on one side and the corresponding total pipeline amount on the other. Pyramid charts use horizontal bars that can be sorted, highlighting high-value products. Click the Bars plus button, then choose Product to group the rows by product. Click the Bar Length plus button, and then Sum, and choose Pipeline Amount as a second measure. Click Count of Rows options menu (⌄), then select Sort ascending to sort the bars in ascending order. 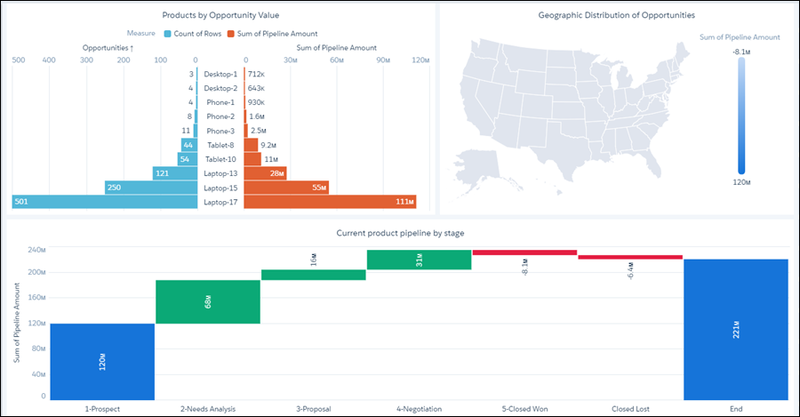 Make sure the Product Pipeline USA dashboard is open. 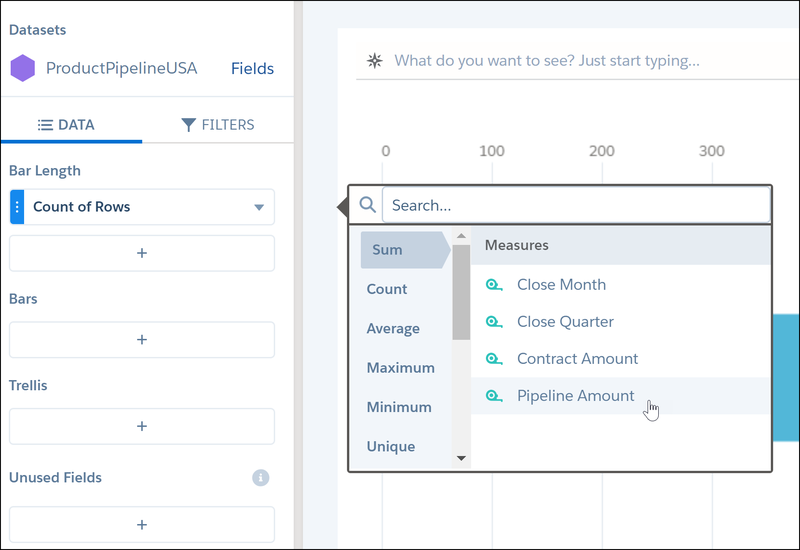 Click to clip the lens to the Product Pipeline USA dashboard. In the Display Label dialog, click Clip to Designer without giving the step a label. We'll use the default label. Click the Product Pipeline USA tile to go to the Product Pipeline USA dashboard. Drag the waterfall and map charts down to make room for the pyramid chart, then click outside the charts to reveal the steps again. Drag the step called Product_1 from the right sidebar onto the canvas to recreate the bar chart. With the bar chart selected, choose the pyramid chart from Chart Type. Scroll up to the top of the Widget section, and click out of the Chart Type area to hide the chart types. Scroll down the Widget section, then click Legend to open the legend options, and choose top-center from the Position menu. In the Widget section, click Left Axis and set the the title to Opportunities. Scroll up the Widget section, and set the title of the chart to Products by Opportunity Value. Use the sizing handles to change the sizes of the pyramid and map charts so that you can place them next to each other. Click to see the dashboard you created. You now have a dashboard with three charts that give you and your colleagues a snapshot of the current status of your product pipeline. But this is just the beginning, because you've just opened up a whole new world—one where rows of data can be easily transformed into beautiful and effective dashboards. So go ahead and high-five yourself! And now go share that dashboard...just brace yourself for more high-fives.